Save the world tree Yggdrasil! YGGDRASIL is a tensed and immersive co-operative game, in the North myths. An epic adventure in which every player has a special role to play. A game for 1 to 6 players, from 14 years old and up. Game duration: 90 minutes. 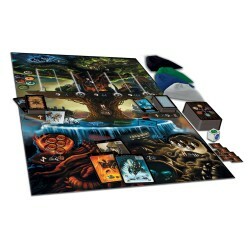 This version does not contain the Asgard expansion, but the Transe rules has been added with the 6 Gods from the base game.